Furniture is one of the bigger purchases we make for our homes. We don’t buy it often because of the cost involved but, if you’re tired of your furniture or in need of something for a particular area and don’t have a lot of money to shell out, there are a few simple things you can do to get the furniture you need. Re-purposing furniture you already own is a great way to fill a need without making a trip to Walmart. You might have an old low dresser that would make a great buffet for the dining room or an armoire that could be re-purposed as storage for linens in an alcove. A side table previously used in the living room could double as a night table in a bedroom. All it takes is to imagine the furniture you have in new ways and sometimes, just switching a few pieces around is as good as buying something new. Your home gets a fresh look and feel and you didn’t need to spend any money. You can create a totally new look for your current lamps by decorating plain lampshades with fabric, easy-to-apply stickers or decorative trims. Easier yet, simply buy a new lampshade in a color that matches your decor, rather than a whole new lamp. Likewise, rather than replacing your existing fabrics and curtains, why not give them a makeover by simply replacing or adding trim? 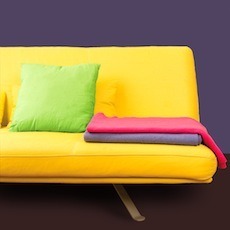 New cushion covers can transform out-of-date sofa cushions in an instant. People throw out the darnedest things. You might find a perfectly good kitchen table left by the side of the road or a dresser in a thrift store that only needs a lick of paint to revive it. Sometimes, rather than go to the bother of trying to sell a piece of furniture, people will offer it for free on sites like Craig’s List or Freecycle and you could nab a great new chair for the living room or a desk for your kid’s room. Then all you need do is invest some time on a Saturday to sand and repaint a dresser or table to suit your decor. Adding new hardware to a dresser is also a good way to update it and make it your own for a fraction of the cost of buying a brand new one. Refresh chair and sofa fabrics with a steam cleaning or add slip covers. Bartering has become popular again. Check out Craig’s List and Kijiji’s bartering sections to see if someone has a piece of furniture you could use. Then suggest a trade; something they have listed that they want and you can provide, for the coffee table or set of dining room chairs they have and you want. If you go to pick furniture up and don’t like what you see, you’re under no obligation to complete the trade. You could also ask friends and relatives if they would like to trade some pieces. Chances are good that someone in your circle would like to make a change in their homes, too. Once you decide to buy, don’t rush the process and get only what you need. Try calling a wholesaler to ask them if you can buy from them directly. Many wholesalers will sell direct to the public and some will even include free shipping, which means more savings for you. Never pay full price. Shop at the end of season to get older model items at clearance prices. If you’ve waited years for a new sofa, you can wait a few more days or months while you shop around for just the right one at a price you can afford. If you rush out and buy the first thing you see, you may regret it later. By waiting, you might even be able to pay cash for your new sofa, rather than having to finance it. It’s relatively easy to save money on the furnishings you need for your home if you are inventive, patient and a savvy shopper. It may take a bit of time or some elbow grease but the result will be a home that’s uniquely yours. I’m a big fan of searching on Pinterest for ways to update furniture and decorate. I have a sofa that has been with us for years. That sofa is highly comforting and relaxing which is why we never decided to replace it. We decided to change its covers for the second time now and proudly it is looking new, trendy as well as matching to our new interior. Those useful tips stated above are really helpful and will surely save my money as furniture nowadays is a really expensive. The best thing I think would be to find ways to repair and renovate existing ones whereas to replace them which would cost a lot. The idea of buying directly from wholesaler is a good idea as it is cheaper and is sometimes of better quality. Practicality is your best ally when it comes to home re-decorations and saving your budget. These are all excellent tips, Marlene, thanks very much for sharing. I’m sure a lot of readers will find this post very helpful. Cheers! Recently my girlfriend and I went shopping for living room furniture and I was surprised at the cost. It was going to be $600 just for a couch. We ended up finding a like new 4 piece living room set for $500 on Craigslist. It looks like we bought it new!